Green Coffee Beans - The World's Best! What You Should Know When Seeking the World's Very Best Coffee Beans for Home or Shop Roasting! Welcome to our green coffee beans page. * You want to gain some working knowledge of the appearance, origins, and processing of green coffee beans. * You are interested in acquiring the very best coffee beans possible for home or shop roasting. * You are planning to open your own roasting company and would like more information on one of the best green coffee importers in the business. Arabica and Robusta beans are the most well known species of coffee grown commercially for consumption. Arabicas are high grown (usually 3000 feet and up) with a much wider range of taste and, depending on the handling, are considered to be much better in quality. Most specialty coffee shops use exclusively Arabica beans (You know, the stuff in the fancy valve bags) with the possible exception of the addition of Robustas in some espresso blends. So with the above in mind, you see that the world's best coffee is the Arabica. 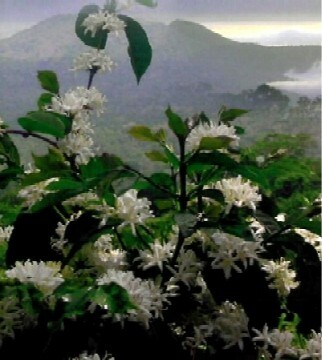 This wondrous coffee can be found in mountainous growing regions all over the world within 1000 miles of the equator. Why is mountain grown coffee better? Well, the rule of thumb is-the higher the coffee is grown, the harder the bean, the harder the bean, the better the flavor. 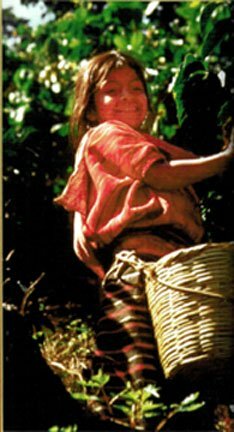 Oh, yes, and before I forget, the best mountain grown coffee is picked by hand, only upon ripening, one beautiful coffee cherry at a time! Coffee beans are the seed of a fruit or berry called a cherry. You will see illustrations of coffee "cherries" below. What is a peaberry? Well, I'm glad you asked! Peaberries are a naturally occurring mutation where a single bean magically forms in the cherry rather than the two flat beans that we are familiar with. Green peaberry coffee beans are pictured here. Notice the smallish whole beans rather than larger coffee beans in two halves. During the last century coffee was brought into consuming countries by sailing ships. The hazardous journeys took months and exposed the coffee to very hot, moist salty air, common in a ships hull. The constant exposure to these conditions caused the coffee to "age" very quickly creating desirable characteristics that would soon be lost to modern shipping methods. One method of aging is to simply store the green coffee in the hot, humid environment in which it was grown, from one to three years before shipping. Another method, known as "Monsooning", exposes the green coffee directly to the elements to simulate the long sea voyages of earlier centuries. Both methods impart an almost syrupy body with a distinctive mustiness. It is thick and rich on the palate, and naturally low in acidity. Now obviously, we all know that this is the removal of caffeine from green coffee beans, but how is it done and why are some methods better? You will find detailed information about the different processing methods here: The Best of the Best Comes in Decaf too! The sometimes not so obvious reason that the quality of green coffee beans is so important is that even expertly roasted coffee can only be as good as its source. Although we absolutely love our morning cup of Joe here in the U.S., darn it, coffee just doesn't grow here on the mainland. That being true, I guess it's really no surprise that many folks here have no clear idea what the actual source looks like. We have customers at Lakota Coffee Company that quiz me about green coffee all the time while I'm roasting. They'll say things like, "Geez, I thought those coffee bags piled all over the store were just for looks!" or "So that's what green coffee looks like..."
This invariably leads to an avalanche of questions about the coffee industry that I've made a sincere effort to answer here in this site. Many books have been written on this subject, some of which are noteworthy and will be discussed on this site. So this page, although greatly simplified endeavors to give you a better idea where the best green coffee beans in the world come from and how they get into an appropriate condition for roasting. NOTE: Once again, in keeping with the focus of this site, we are only discussing the world's very best Arabica green coffee beans grown at 3000 feet or higher. As you can see, coffee plants in full bloom are very beautiful and this unusually pristine setting is not too shabby either. 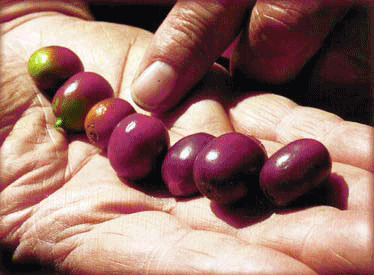 Pictured here, coffee beans are the seed of a fruit, or coffee cherry. Notice the greenish ones on the left and the ripe and ready ones on the right. This is a lovely Mexican finca or coffee farm. Coffee beans from these high mountain fincas are painstakingly hand picked as they ripen, one exquisite bean at a time. The cherries grow in clusters and can be very difficult to get to. There are no tools used here. It’s all about hands and fingers to strip only the ripened coffee cherries hiding in each cluster. Each tree, believe it or not, only produces from one to two pounds of green coffee beans per season but will continue to produce for many years. Some coffee regions have just one growing season based on one rainy season and one dry season. Some coastal growing regions have as many as five harvests per year. Cool air and long ripening times allow this mountain grown coffee to display very highly developed, complex flavor, thus the very best coffee tends to be found in regions with one long growing season. That’s why all the fuss about high grown coffee. It displays much more intensity in the cup. This photograph hangs above our daily brewed coffee selections at Lakota Coffee Company. The majority of these farms are twelve acres or less and are run by families. Sometimes the whole family or families, young or old, as well as hired pickers in some instances help with the harvest, much like many vineyards. Larger plantations hire hundreds of pickers at the height of the season. 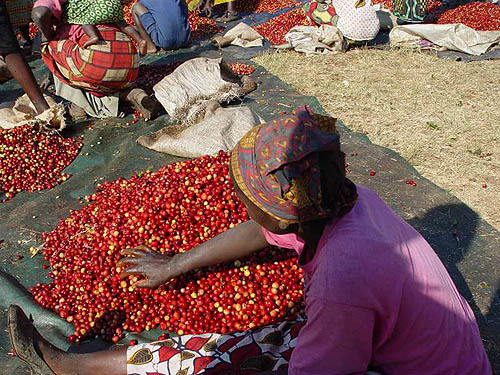 Washed coffee (the wet method) is more elaborate and expensive than the dry process. It can only be used in areas where water supply is pure and plentiful. *	Fresh picked ripe green coffee beans, or cherries are immediately plunged into a large tank of water where the over-ripe or shriveled cherries float to the top and are removed. *	The good fruit that’s left gets sent to a de-pulping machine that strips the fruit from the seed or bean. *	The green coffee beans are then sorted by a series of rotating cylindrical grates called sieves. This process holds back the skins and gradually sorts the beans out by size. *	The beans end up sorted by size into separate stone tanks where the seeds ferment for approximately 48 hours to loosen the remaining pulp. *	The fermented mucilage is then washed by running the coffee down a series of elevated waterways where the beans are even further sorted by size. The coffee ends up in stone drainage tanks where it’s held until the water drains away. The wet method is highly desired by many as the more sophisticated treatment for fine coffees. Washed coffees are very “clean in the cup”, with bright and vibrant acidity. Lest we think this is the final word, there are those who find the dry method preferable, as in some of the highly prized Sumatrans, Yemenis, and Ethiopians, for their amazing earthiness and luxurious body. At Lakota, we carry wet and dry process green coffee beans and find great quality in both. The Dry or Natural Method is the oldest and simplest method for “curing” green coffee beans. It’s much less expensive because it doesn’t require all the fancy equipment. It takes a few weeks to complete and minor differences in the process vary widely. *	The coffee fruit is spread out 4 to 5 inchs deep in the sun on large concrete or clay drying patios or sometimes wire mesh. *	The cherries are raked until thoroughly and evenly dried. *	The dried green coffee beans are often stored in silos or laid out on plywood and covered with canvas until shipped. Clearly the washed coffee (on the left) has a processed appearance because it's sparkling clean. 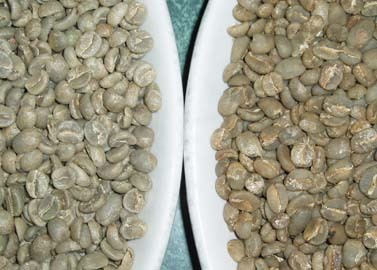 The effects of sun drying and the remains of fruit pulp cause the dry processed coffee (on the right) to take on a darker color. It also has a "mottled" look as if it might be lower in quality than its washed counterpart. Both of these coffees roast to a beautiful deep brown and they both have their own outstanding qualities. One is truly not "better" than the other, different but not better, at least in our humble opinions. Besides, quality "in the cup" is determined by coffee import experts who cup coffee based on its inherent qualities, regardless of how the green coffee beans are processed. Washed coffee can demonstrate more vibrant acidity and a "cleaner taste" in the cup. Dry processed coffee demonstrates rich, earthy body. If you love coffee the way we do here at Lakota, I think it’s good to know a little bit about origins, harvesting, processing and such. However, None of this matters unless the quality of the coffee “in the cup” is known. Sure, it’s high grown. It is grown in perfect volcanic soil in a perfect climate. The beans are beautiful, blah, blah, blah… it’s all rubbish until someone who knows what they’re doing actually “tastes” the properly roasted, ground, and brewed finished product! And I don’t mean here in our coffee shop. I mean right there at the source. I hope I haven’t beat this to death on this site but… we have once again come full circle to the all-important green coffee importer. I can roast coffee until the cows come home. I can be the best professional coffee roaster this side of the Mississippi. But it's all to no avail if I’m not roasting coffee that has been expertly cupped and carefully chosen for it’s incomparable quality in the cup! 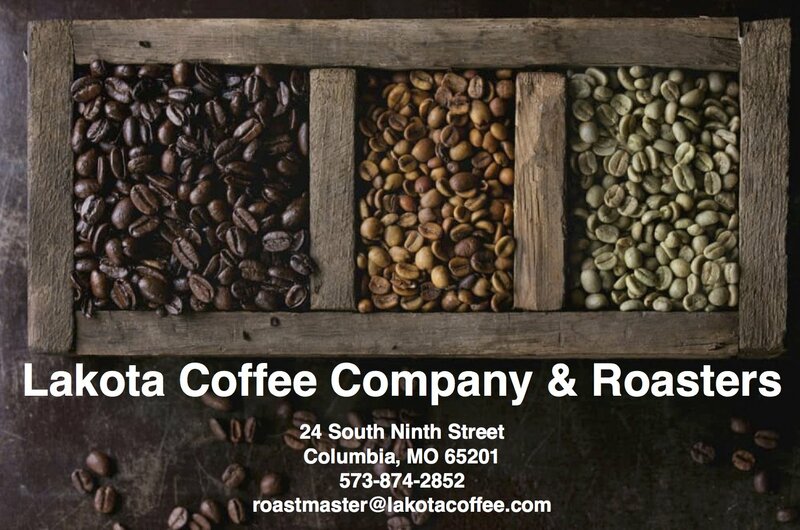 Lakota Coffee Company and Roasters works with several green coffee importers who do this very well. Current Green Coffee Prices and Descriptions are Available From Our Home Shopping Cart - Link is Posted After Our Guarantee Below! Please remember, these coffee beans have been expertly cupped in some of the finest growing regions in the world and may be pricier than sites that clearly sacrifice quality for price. Also please note that the tragic tsunami disaster in Indonesia and other factors beyond our control have caused coffee prices to soar to record highs. 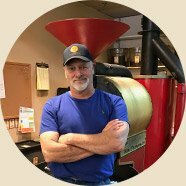 Lakota Coffee Company’s Green Coffee selections are in keeping with all of the exacting standards discussed in this site and we would like to share our experience of "Coffee Nirvana" with you!